On yet another delightful, mid-October day, I was compelled to go for a ride with the top down-there won’t be many more “top down” days this year. 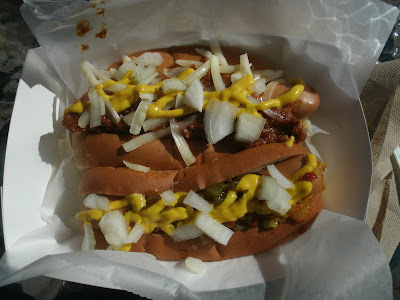 Hot Dogs were on my mind and I remembered a place Hot Dog Mary told me about when we visited her back in the summertime. 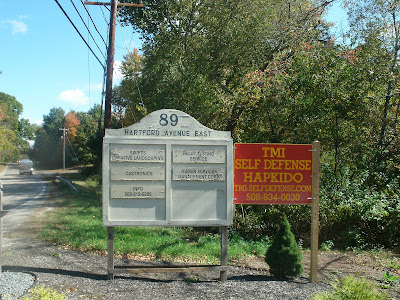 As I cruised through the scenic back roads of Mendon, Massachusetts, this road side sign told me I was at my destination. 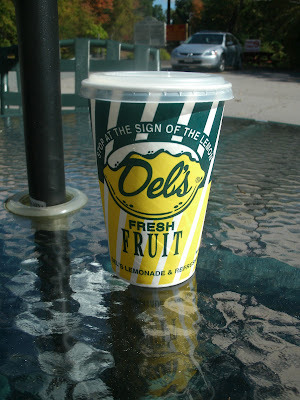 The Del’s Lemonade sign piqued my interest. 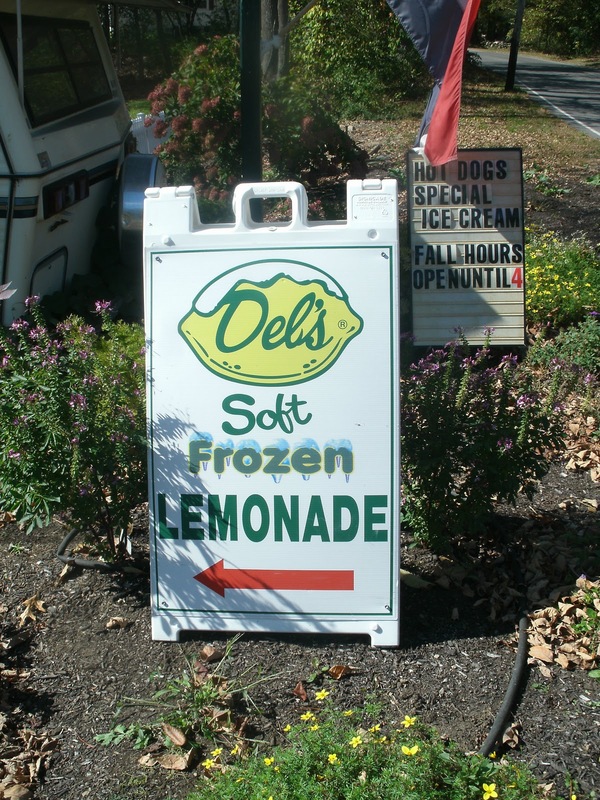 Del’s is a regional favorite. It’s a kind of lemonade slush that’s widely available in Southeastern New England-they even have their own franchised restaurants. 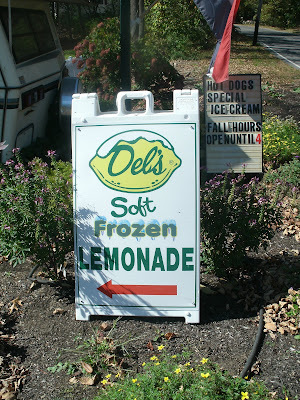 I wasn’t at a Del’s though, just a place that serves Del’s products….. I got out and took a closer look. 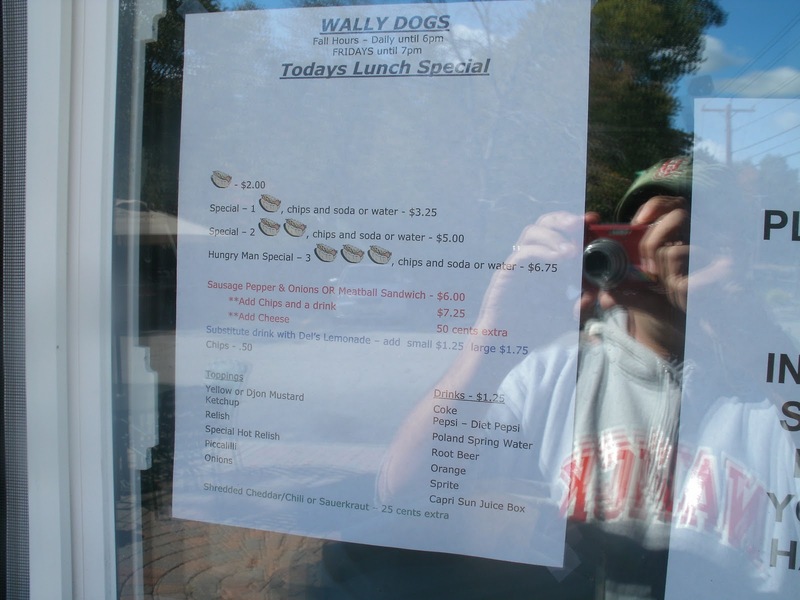 Wally Dog’s is owned and operated by Beverly and Walter (Wally) Swift. Here’s Beverly, who graciously stopped by to greet me. She’s a mini business tycoon- Wally Dogs isn’t her or Walter’s only business concern. 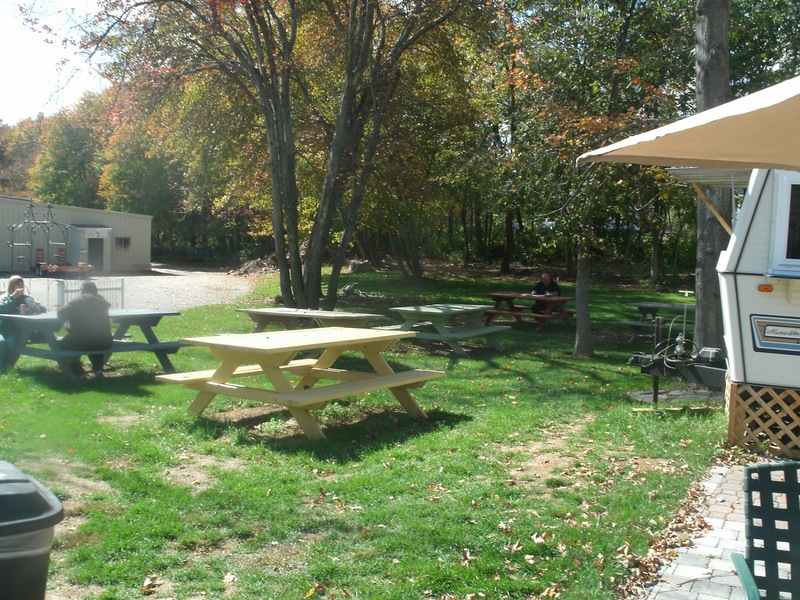 Walter owns Swift’s Creative Landscape, which has its world wide headquarters on the same property as Wally Dogs. They’re located at 89 Hartford Avenue East in Mendon, Massachusetts. 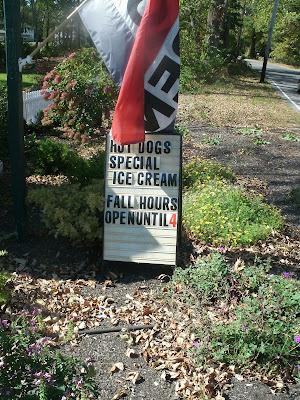 The hours are seven days a week from 10:30ish until 4PM in the fall. In the summer, they stay open until 8PM or “whenever customers leave.” They stay open until the point in the season “when nobody comes by.” Last year they closed in mid December and reopened in March. Walter’s so busy with his landscaping business, he rarely works at Wally Dogs. Beverly works there “occasionally.” The stand was staffed today by “Ellen,” who was camera shy. 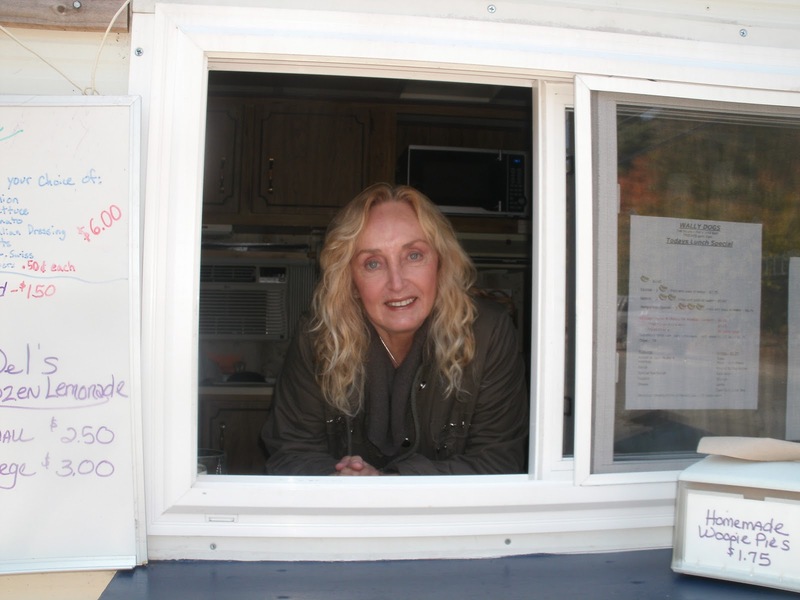 During the summer, Bev and Walter hire local high school kids to staff their trailer. Which brings us to the trailer. This is Wally Dogs’ second year in business. 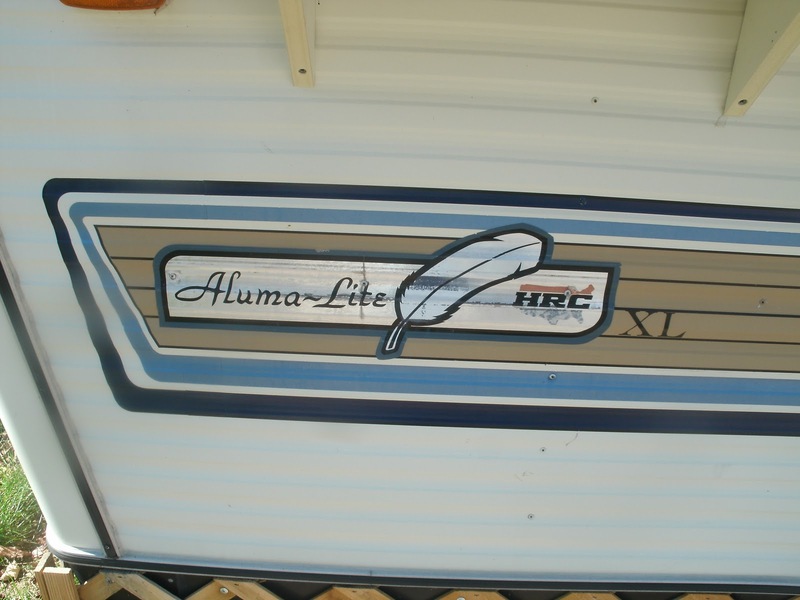 The first year was spent in THIS trailer. 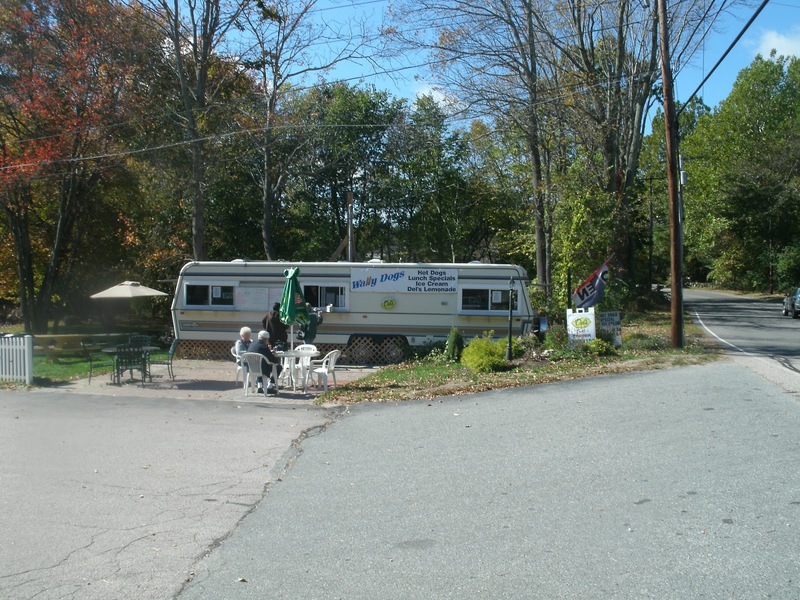 Bev and Walter weren’t looking to get into the hot dog business, they were looking for a use for their old camper that was just taking up space in the parking lot of Walter’s landscape business. Walter talked to the building owner and asked if he could open a hot dog stand at this location. 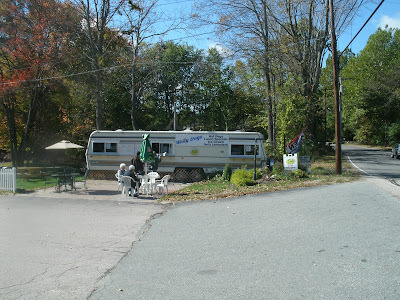 When he got the green light, they converted their old camper to a hot dog trailer. 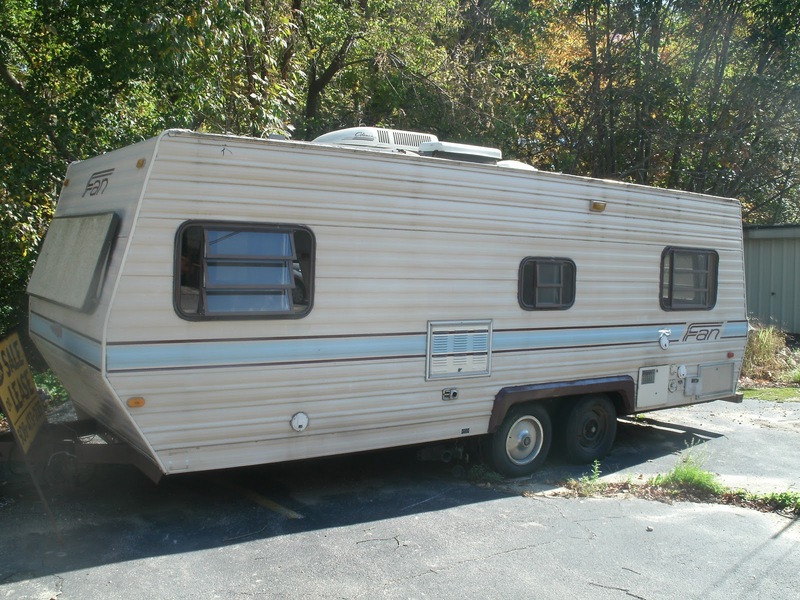 They found this trailer to be a tad too small for what they had in mind, so they grabbed another, larger one from a relative and converted it as well (the old trailer will be up for sale if you’re interested). 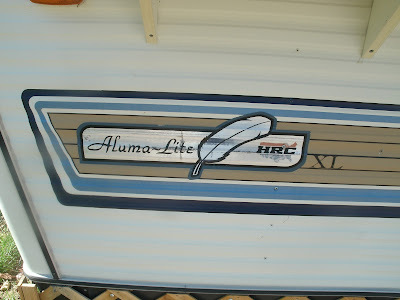 Bev didn’t know much about the age or make of the trailer, she figures it’s “from the 80’s.” I snapped this picture of the trailer’s badge. The inside was completely gutted and a new kitchen was installed. 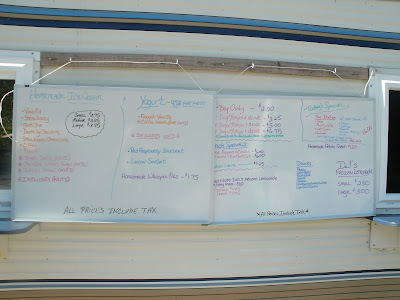 They have a grill, steamers, microwave, refrigeration, 4 sinks, storage and a full ice cream freezer too. The trailer stays put- it’s a seven day a week concern. 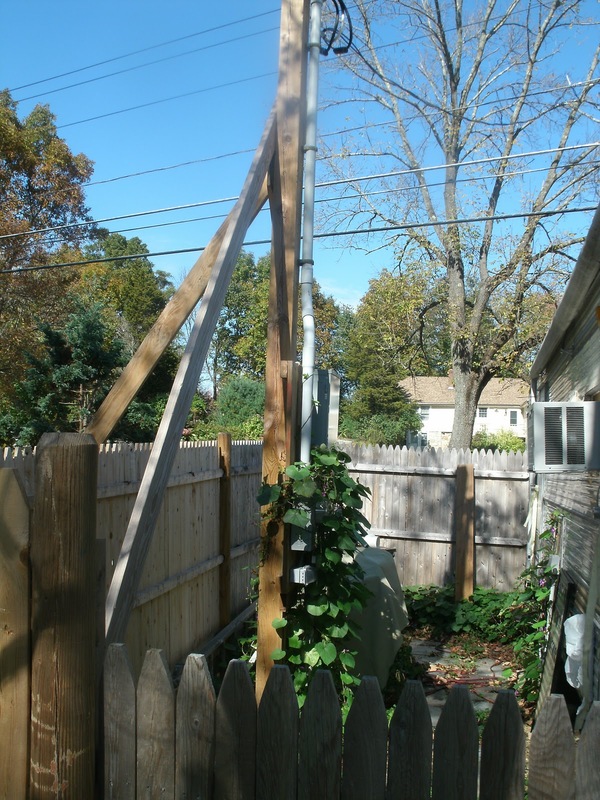 They power it right from the grid through their own pole. 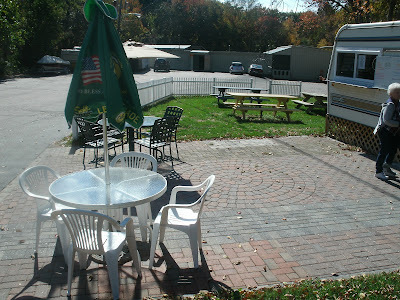 Note the air conditioner on the right-THAT’S a good thing to have on those hot summer days! 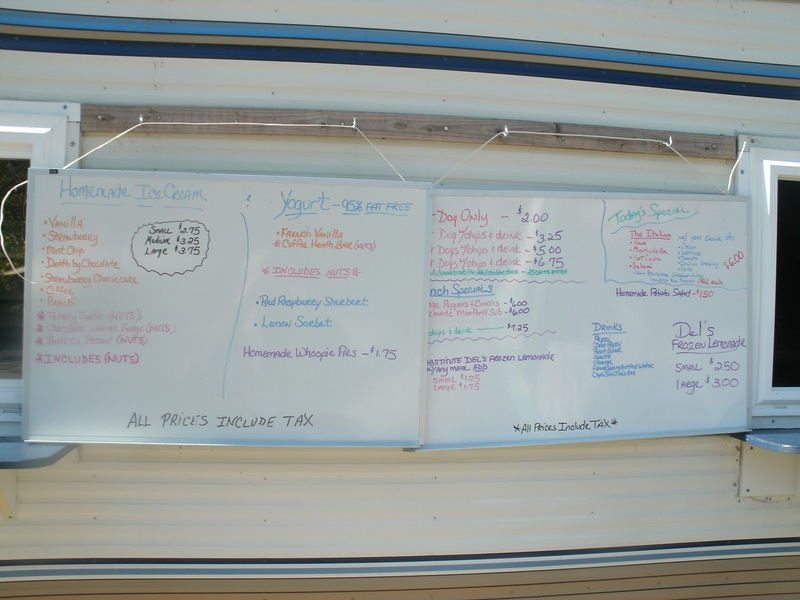 The hand written menu got a bit bleached out in the bright, October sun. 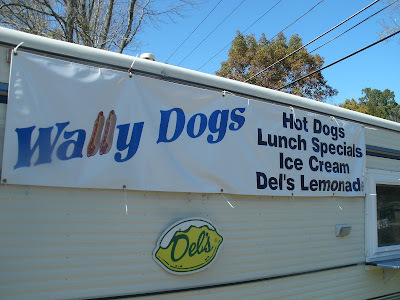 They have home made ice cream, frozen yogurt, sherbert, the aforementioned Del’s Lemonade, Italian sausages, meatball subs and a daily special (today’s was an Italian Cold Cut Sub) in addition to their hot dogs. 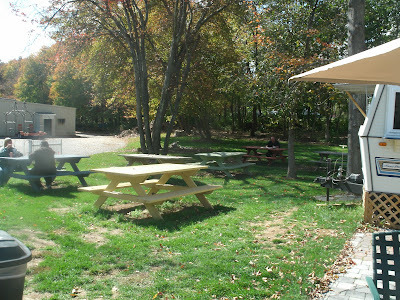 I ordered up and surveyed the nicely landscaped dining room. Walter must do brick patios too- a very nice touch! I went for an all around dog with the “Special Hot Relish” (bottom) and a home made chili dog with cheese mustard and onions. They look tasty, eh? The dogs were piping hot and had that signature, Kayem snap. The Special Relish was hot enough to put a couple of beads of perspiration on my ample brow. 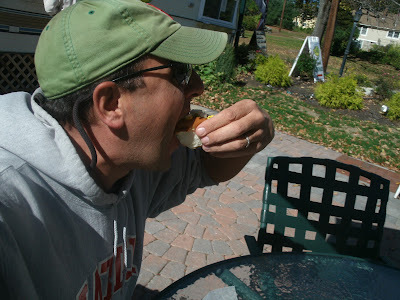 The chili was an all meat variety, not as spicy as the relish! It had a rich, barbecued flavor and it was very good. I’d have it again. 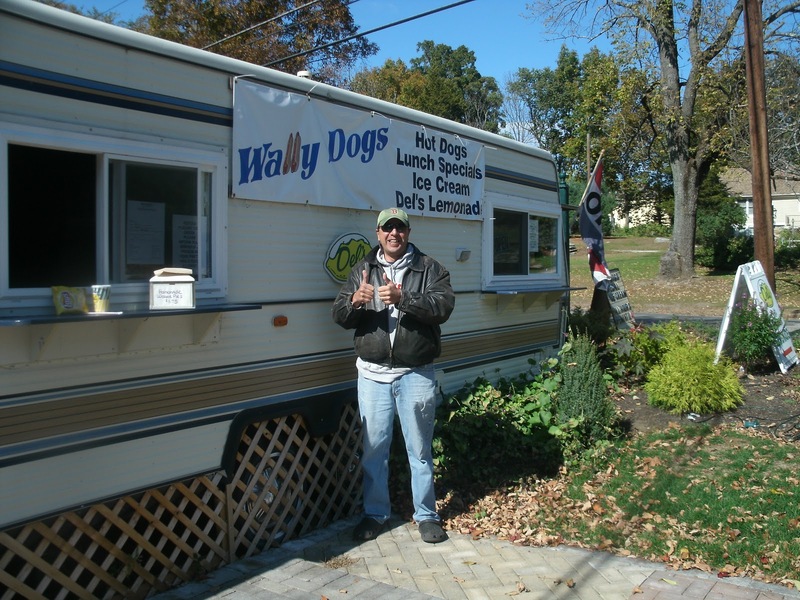 Wally Dogs gets TWO THUMBS UP from the Hotdogman! 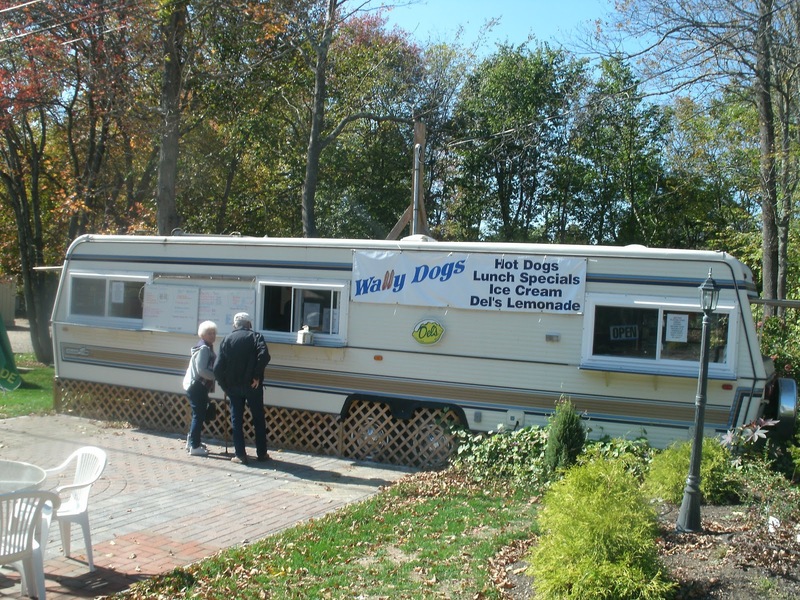 If you find yourself in Mendon and you’re looking for a good lunch spot, give Wally Dogs a try. Those hot dogs look awesome. Good luck.